THE CANADIAN PRESS -- VANCOUVER - Hockey fans in Vancouver have been comparing the post-game celebrations during the Canucks' playoff run with the crowds that flooded the city during last year's Olympics, but Saturday's inevitable street party after the team's Game 2 victory was the first to really rival the Winter Games. The crowds that flooded into the streets after Alex Burrows scored 11 seconds into overtime, defeating the Boston Bruins 3-2, were by far the largest the city has seen since the Canucks entered the playoffs. Vancouver police put the number at about 70,000. An sea of blue Canucks jerseys the width of Granville Street packed the popular entertainment district for several blocks, and screaming fans stopped traffic on other major routes along the way, waving flags, begging for high-fives and encouraging rhythmic honks from drivers who had little choice but to watch the party. "This is amazing, this is the Olympics all over again, but bigger," said 24-year-old Nicole Kwieton, who watched the game with some friends at a hotel bar. "It's awesome to see Vancouver come together and everyone's so positive. Vancouver is just on its feet and ready to party." Kwieton said the Game 2 victory bodes well for the Canucks' chances going forward. "Awesome game, the way Burrows scored, it was the total definition of how the Canucks have been playing," she said. "It's just hard, solid work the whole way through." Thousands of fans watched the game under beautiful, sunny skies at several outdoor screens set up throughout the downtown. Many more packed local sports bars, and they were all joined by the lucky fans who poured out of Rogers Arena after the game. Andrew Arrica was at the game, and immediately joined the party outside once it was over. "This whole town is positive, you've got to feel it," said Arrica, 30. "We've been thinking the whole time, positivity, positivity, positivity, and that's all that matters." Arrica remembers the last time the Canucks were in the playoffs in 1994, when the team lost to the New York Rangers. "We watched it, and it was pretty intense," he recalled. "I was a lot younger, and I had more emotion involved in it. it was a bit of a tear-jerker." By 10:30 p.m., police hadn't reported any major problems. Some fans had set off fireworks, and officers rescued a woman who became trapped in a porta-potty with a broken lock. Other cities in the Lower Mainland have set up similar outdoor celebration sites. During the away games in Boston, fans will be able to watch on screens inside Rogers Arena. Like the Olympics, the crowds downtown have been relatively well-behaved during the Canucks' playoff run. After Game 1 last Wednesday, Vancouver police said they made only a few arrests, mostly for public intoxication, and broke up a few fights. 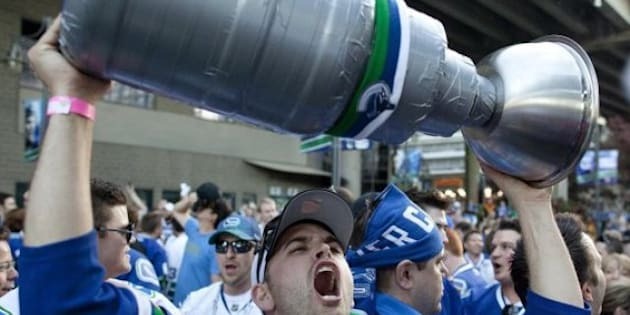 The Vancouver Police Department expects to spend up to half a million dollars on crowd control during the final round of the playoffs. The city is still living with memories of the riots that followed the Canucks' Stanley Cup loss to the New York Rangers in 1994, causing $1 million in damage, injuring 200 people and leading to charges against more than 150 revellers.